We got our hands on the IRONMAN Gravity 4000 to carefully test and review the product. By purchasing the product through our affiliate link you support our work and future reviews. comfortable and spacious backrest with adjustable lumbar pad. The disadvantage of the IRONMAN is the difficult handling of this inversion table. The device is heavy and bulky, so transfer between rooms is recommended by two people at minimum. On the other hand, the weight of the device contributes to better table stability. Users who prefer stability, safety, and exercise comfort will be very happy with this product. Thanks to its high load-bearing capacity and spacious backrest, the IRONMAN 4000 provides people with a higher body weight and people with a more robust figure with a table they can appreciate and use safely. Older people or people with limited flexibility will surely also appreciate the extended ankle holder locking mechanism. However, users with a height of 6 ft. 5 in. (195 cm) or above would be better-suited to inversion tables from other manufacturers, such as the Innova ITX9600 or the Teeter EP-960 Ltd. These inversion tables provide greater comfort and backrests that accommodate tall users. Overall, the IRONMAN Gravity 4000 inversion table has left us with a very good impression during testing. Despite the small deficiencies we found, we believe that in terms of price and value, the IRONMAN is one of the best offers on the market. We were greatly impressed by the packaging of the IRONMAN Gravity 4000. The parts were carefully wrapped in protective foil. On the sides of the package, as well as between the various parts of the device, a large number of polystyrene prisms were used, which both reinforce the package as a whole and also prevent the movement of the individual components within the package. Thanks to this method of packaging, the product is very well protected against any damage during transportation. The package we ordered was delivered completely undamaged and we evaluate the IRONMAN packaging as among the best in the inversion table market. owner’s manual and parts list. The manufacturer recommends that two people handle the package, with a weight of 86.4 lbs (39.19 kg) and a size of 50.2 x 29.13 x 9.06 in. (127.5 x 74 x 23 cm). From these dimensions, it is obvious that the package is really bulky and heavy. Only a truly physically capable individual is able to handle the weight of about 86 lbs (39 kg) himself. An obstacle to handling of this shipment for one person is not only its high weight but also its volume. The package is hard to hold onto and can easily slip out of your hands and fall. This may cause product damage. If you can, you would be better off handling this shipment with two people. Screw anti-skid plastic foot caps to the base frame. Replace the two nut caps and attach two protective covers to the frame. Put the pivot arms on the backrest and then screw the backrest to the frame. Complete the ankle holder, which is factory-fitted to the height adjustment tube. Connect the height adjustment tube to the backrest. Install the handles and attach the nylon strap. Place the lumbar pad on the backrest, and you are done. We are very glad that the base frame itself is delivered already assembled. We also are pleased that the partially-folded ankle holder is included in production, because you only have to mount the U-shaped holders onto it. Such parts, which are already assembled at the factory, greatly facilitate and accelerate the overall assembly of the inversion table. Assembly of the IRONMAN is further facilitated by pre-split fasteners. All screws, nuts, washers and caps are shipped separately and individually packaged according to the individual steps above. This makes it easy to find out which screws or caps you have to use at each given step of table assembly. Of course, there is a detailed description of the assembly, including a graphical representation of the individual steps, in the enclosed owner’s manual, and the supplied assembly spanners allow the device to be easily assembled. Assembly of the IRONMAN Gravity 4000 is easy to handle, and you can manage it within 20 minutes. Due to the high weight of the device, we recommend that this inversion table be built by two people. Some components are heavy, and their handling requires strength – for example, when attaching the backrest to the frame, we could hardly imagine that one person would be able to do it alone. Now let’s look at the measured dimensions of this IRONMAN in three different positions during our testing. To exercise safely, you need to have enough space around the inversion table. During testing, we found that it is possible to exercise comfortably even with only 4 – 5 in. (10.2 – 12.7 cm) of space in addition to our measured table dimensions. However, we recommend having at least 2 ft. (61 cm) of extra space around the table. This makes you feel safer and, moreover, you do not risk, e.g., knocking over your furniture during exercise. For completeness, we mention that the weight of the IRONMAN Gravity 4000 is 76 lbs (34.47 kg). The high weight of the inversion table needs to be understood from two different points of view. On one hand, such a high weight creates great complaint regarding the handling of the table. On the other hand, however, the table is stunningly stable due to its high weight and offers more capacity than many competitive inversion tables. Thanks to this, people who weigh more than 300 lbs (136 kg) can still utilize the inversion therapy. From these values and measured dimensions, the IRONMAN Gravity 4000 is a heavy and robust inversion table with a high maximum load. This table will be appreciated primarily by people with a higher body weight or people with a heavier or more robust figure. Despite its considerable bulkiness, this table fits into every common room – like each inversion table from our list of best inversion tables on the market. You can comfortably fold the IRONMAN in a few seconds. Slightly push the upward folding arms that are located on the top of the frame under the fabric protective covers and then fold the base frame. In this position, the table is 72.44 in. (184 cm) high, 32.28 in. (82 cm) wide, and occupies only 23.03 in. (58.5 cm) of space out from the wall, which is more than 29.5 in. (75 cm) less than the table in the position intended for exercise. In this storage position, when the backrest of the inversion table is facing the wall (or the wardrobe, etc. ), the device is stable and there is no danger of a table falling or spontaneously collapsing. IRONMAN recommends not storing the device in the opposite position, with the front of the backrest pointing into the room. During our testing, IRONMAN was not stable in this position and, due to its high weight, spontaneously unfolded and fell into the room. The ability to fold the IRONMAN inversion table after exercise into a storage position is sure to be appreciated by every user. Thanks to this, the table takes up much less space and can fit comfortably into the corner of the room or you can rest it next to the cabinet. The table in the storage position is also easier to manipulate, which you will appreciate especially when transporting the table to another room. The quality of the materials used and the quality of the workmanship is very good. We praise the tubular steel frame, which is massive and quite stable. The workmanship of the individual welds on the steel frame is good and the frame has a high-quality varnish. We also like the quality of the welds and varnish on the metal frame of the backrest. The backrest amounts to the biggest advantages of this inversion table. It is massive, spacious, and padded with a huge amount of soft foam material, making you feel comfortable during exercise. We also have to praise the quality of the backrest manufacturing, because it is covered with fabric and the quality of the seams is exemplary. Another advantage of the backrest is the possibility of attaching an additional lumbar pad to give you even more comfort and body support in the lower back area. You will be pleased with the quality of the handles. There is, of course, solid, metal construction coated with a soft foam material. The handles are long enough to provide sufficient support during exercise. The quality of materials and the manufacturing of the ankle holder also made a positive impression. We have no reservations about the metal and plastic ankle holder components. Also, the U-shaped holder that provides leg support is well-padded and the material used has a better look than the ordinary foam rollers that you will find on cheap fitness machines. The IRONMAN also features plastic, anti-slip foot caps. Thanks to them, the inversion table is really stable during exercise. These covers, however, are made of very hard plastic. If you have soft floors in the rooms (e.g., lino), it is recommended that you place the inversion table on a carpet or on a mat to avoid damage to these soft floor coverings. The IRONMAN Gravity 4000 is designed for users measuring up to 6 ft. 6 in. (198 cm) tall and who weigh up to 350 lbs (158.76 kg). During exercise, it’s important that a user “fits into” the inversion table. This is the only way to feel comfortable with inversion therapy. An important parameter when selecting an inversion table is also the width of the device between the metal grips where the backrest is attached to the frame of the device. The width of this IRONMAN section reaches 20.08 in. (51 cm), which is one of the best numbers among inversion tables on the market. This model of inversion table will provide you with the convenience of exercising even for those of you who have a more robust or heavier figure. During our testing, however, we discovered one weakness of the IRONMAN in relation to the length of the backrest and the height of the user. We found that people measuring 6 ft. 5 in. (195 cm) or more do not have enough support or head comfort. These people are leaning the back of their head against the backrest‘s edge, which is not pleasant. This finding was surprising. The IRONMAN Gravity 4000 has a spacious backrest that measures 41.14 in. in length and 18.5 in. in width and, also, thanks to its high load capacity, is especially comfortable for people with a more robust figure. Such people are often taller, too, though, and this is where the problem arises, because these taller users of the IRONMAN will not find proper head support or comfort. Tall users will probably be better off with the Teeter inversion table, or Innova, and IRONMAN’s manufacturer should certainly consider extending the backrest a few inches. Use the nylon straps to set the maximum inversion angle that you want during exercise. The safety nylon straps have robust metal carabiners on each side – hook one carabiner to the user’s height adjustment tube and pin the other carabiner to the frame of the inversion table. The length of the nylon strap is adjustable and decreases the length of the strap or increases the maximum inversion angle. Thanks to the adjustable length of the strap, you can reach a tilt of just a few degrees or nearly full inversion – it’s up to you. If you disengage the strap, IRONMAN will allow you to achieve full inversion, i.e., a 90-degree tilt. In this position, the backrest stops against the metal frame and will not let you invert any further. During our testing of inversion tables, we came to the conclusion that the nylon strap is better than a mechanism that works with several pre-set angles using a metal pin to adjust the desired inversion angle. This mechanism is featured, e.g., on the Innova ITX9600 inversion table. The advantage of adjusting the inversion angle with the strap is the greater variability offered than with the mechanism using several pre-set tilt positions. You can always set the strap at exactly the inversion angle you want. The disadvantage of adjusting the inversion angle with a strap is that you do not exactly know how big the angle is that you have set. Therefore, before exercising, always check the maximum angle. To control the set angle, just turn the backrest. Whatever angle of inversion you set, it’s always necessary to securely attach your legs to the inversion table using the ankle holders. The IRONMAN Gravity 4000‘s ankle holder had one big, positive surprise for us during testing. At first glance, we were skeptical about the U-shaped holder. Compared to other components, they were small in size, and not only in size but also in padding. During exercise, however, these holders proved to be absolutely great. The ankle holding system holds your legs firmly in place, giving you a feeling of safety and security even at greater inversion angles. Padding is really good and very pleasant. This gives your ankles a high level of comfort during exercise. There is no pain at any angle of inversion nor any unpleasant leg shocks. We are also pleased with the extended locking mechanism, which allows adjustment of the ankle holder to the desired position, thus attaching the legs to the inversion table. You can see the extended mechanism in the picture below. It is the black bar between the U-shaped holder. This locking mechanism is especially useful for the elderly or for people with limited flexibility, because these people will not have to lean as much as as they would with some inversion tables from other manufacturers, whose adjustment of ankle holder position is only determined by a short metal pin. IRONMAN offers a wide range of feet mounting positions. Individual positions are numerous and are relatively close to each other, making the finding of optimal ankle holder settings easy for every user. From the point of view of the comfort offered by this ankle holding system, it is possible to compare the IRONMAN Gravity 4000 to the Teeter EP-960 Ltd., which belongs to the highest tier of the inversion table market. Among the extra features of this table is the already-mentioned extended mechanism for adjusting the ankle holder. This mechanism is practical and user-friendly. We greatly praise the lumbar pad that provides better support and comfort for the lower back during practice of inversion therapy. The lumbar pad is made of soft foam material, making it very comfortable. The lumbar pad is easily attached to the backrest with a strap and velcro fastener, and you can also slide it over the backrest. In addition, the pad is completely removable, so you can choose whether to exercise with or without the additional support. Attaching or removing the support is only a matter of seconds. The IRONMAN Gravity 4000 features user height adjustment capability with the quick-release mechanism using a metal pin. However, the selected user height can moreover be fixed with an additional screw. This will cause the selected position to be absolutely locked and the height adjustment tube to not to move during exercise. This ensures greater safety during exercise. The tubular steel frame is strong enough and, thanks to the high table weight and massive components, the table is very stable at any angle of inversion. For better stability of the table, anti-slip plastic foot caps and additional bolts for fixing the user height adjustment tube help. Thanks to these components, the inversion table does not move during exercise. Thanks to high stability, you will feel quite safe during exercise. The feeling of safety is added to by the ankle holders, which, besides their easy positioning, also offer a solid but very comfortable footrest. High safety during inversion therapy is also contributed to by the long and firm handles and a nylon strap for setting the maximum inversion angle. In the case of the IRONMAN Gravity 4000, we greatly praise the level of comfort offered by the wide and sufficiently padded backrest. The backrest is spacious and very comfortable. The additional lumbar pad, which is made out of soft foam material, will further enhance the overall comfort of your body during exercise. However, the manufacturer should consider extending the backrest a few inches, because users over 6 ft. 5 in. (195 cm) are not provided sufficient head support during exercise. We also have to praise the comfort of the ankle holder. During testing, it was shown that its U-shaped holders are sufficiently padded and provide not only exercise comfort, but also sufficient support and safety. Adjusting the height of the table by means of the quick-release mechanism and the extended ankle holder locking mechanism further increase the user comfort offered by this table. Thanks to these systems, you can set the inversion table to an optimal position for exercise very quickly and effortlessly. The comfort offered by IRONMAN is clearly among the advantages of this inversion table. This is thanks to its spacious and very comfortable backrest, the quality and convenience of which surpasses that of competing brands such as Innova or Teeter. the ankle holder will not have enough padding. Stability of the table during exercise is first class. The table stands very firm and is stable at any degree of inversion. You can rely on the table a hundred percent. Two table-securing tubes for user height adjustment also contribute to table stability and security. The bar does not move even by a mere millimeter during exercise, so there will be no unexpected change in body weight distribution, which could cause an unexpected change in table angle. In practice, IRONMAN’s backrest has proved to be great – it’s spacious and very comfortable. Lying on this inversion table is thus very comfortable. The backrest directly invites you to sit on it, achieve the desired degree of inversion, and breathe calmly, relax, and enjoy your therapy. We believe that thanks to this backrest you will enjoy inversion therapy! As we have mentioned earlier, the ankle holder surprised us very positively. At first glance, we were expecting limited ankle comfort. However, the opposite proved to be true. During our testing, the ankle holder held us firmly, giving us a feeling of safety and security, even at a greater angle of inversion. The padding has proved to be sufficient and very pleasant. There was no pain and no unpleasant bumps at any angle. The table also responds reliably to human movement and is well-controlled. The IRONMAN Gravity 4000 surpassed our expectations, and the workout on this inversion table impressed us greatly. Inversion tables under the IRONMAN brand are made by Paradigm Health & Wellness. The company is based in the USA in Southern California and is a major player in the fitness, health, and wellness market. The product portfolio of Paradigm Health & Wellness includes, for example, ellipticals, exercise bikes, massage tables, treadmills, inversion tables, etc. 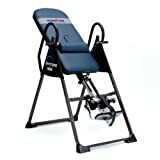 It is interesting that the company even offers two brands of inversion tables – IRONMAN and Exerpeutic. The IRONMAN brand features high-quality inversion tables. These products are in the middle of the inversion table market, and some IRONMAN models are also targeting a higher and more expensive segment of the market. The Exerpeutic brand then represents more affordable inversion tables. Thanks to the wide portfolio of models offered, everyone can select the right inversion table for them. The IRONMAN Gravity 4000 is priced around the middle price level within the inversion table market. They are not among the most affordable models, such as the Innova ITX9600, but they are also not the most expensive tables, such as the Teeter EP 960 Ltd. Overall, this IRONMAN inversion table offers great value for the cost. When it comes to chronic body pain, gravity is our worst enemy. Standing upright the entire day with a steady force pressing against us leaves many people with unbearable pain.